It’s hard to deny the increasingly high rate at which South Florida is exploding in industry and population. With a prime geographic location that is easily accessible from domestic as well as international hubs in Europe, South and Central America, the Caribbean, and even Asia, Miami and surrounding areas are experiencing strong and steady growth. With import/export and global industries requiring large warehouses bringing more industrial and manufacturing business into South Florida, the race is on for companies to find the perfect space to both house and secure their goods as well as provide a safe place for their employees to live, work, and play. Miami-Dade County offers plenty of prime real estate and neighborhoods for businesses and families relocating to the area, but it is the localities in the southern part of the county that can best provide businesses and employees with both access to the world and a familiar feeling of home. Known by locals as “Miami’s Backyard,” the area of South Dade that covers Homestead, Florida City and the Redland is quickly becoming a highly sought-after spot for various industries and the people who come along with them. Companies considering warehouse space in the South Florida area should know that by anchoring their business in South Dade, they are not only insuring that their business is ideally positioned in the growing “frontier” of Miami-Dade County, but that they are assuring a certain quality of life by placing their employees in an area that allows them to live comfortably without a long commute into a city, and by giving them close proximity to the sky blue waters of the Bay, the green grass of the Everglades and the tropical escape of the Florida Keys. ComReal’s partners Ed Redlich, Chris Spear, and Mort Fetterolf know how important the community of South Dade is to the success of the entire county, as each have roots there by living in the area and/or playing an integral role in the commercial, industrial and agricultural development of the Homestead/Florida City/Redland neighborhood. They will soon be announcing the availability of a prime, 15-acres commercial site on Krome Avenue. 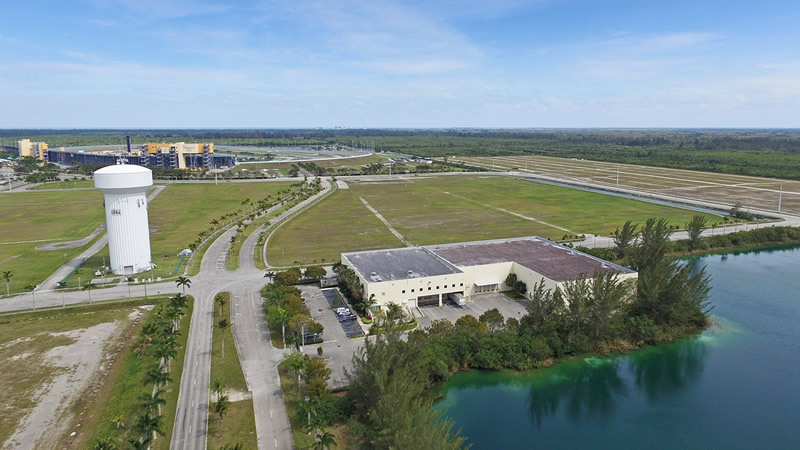 One of the properties that this team is currently showcasing is the largest Class A warehouse building now available in South Dade, which has already has neighbors in critical industries such as logistics, recreational boating, food and beverage, and government industries, to name a few. Located in the Homestead Park of Commerce, near the iconic Homestead Speedway, this warehouse, ideal for distribution, logistics, or manufacturing companies, is a completely modern and functional warehouse with 64,019 square feet of available space. It is zoned industrial with a fire suppression system and three phase electrical power. With 10 docks, including a drive-in, and up to 28 ft. ceilings, any business that calls this warehouse home will have transportation and storage agility for reliable and efficient import and export service. Additionally, the grounds are fenced and gated with security available, and the building is equipped with high-speed fiber-optics for complete “smart-building” capabilities. Be sure to watch the aerial drone video tour on ComReal’s YouTube Channel (the link is https://www.youtube.com/watch?v=Cc1G35PgiCs&t=12s). The ComReal Team has been assisting companies with their South Florida real estate needs for nearly 40 years and has consistently attracted diverse businesses from outside the area that are looking for economical warehouse and industrial properties in communities that can also offer their employees a convenient and contented lifestyle. Some of the current organizations already operating in the Homestead Park of Commerce include: Contender Boats, Budweiser, Dunham Bush, Frito Lay, Goodman Air Conditioning, the DEA, FBI, and others. Visit www.MiamiWarehouseTeam.com and/or call 786-433-2380 for more information on how you can base your company in the growing South Dade frontier.